Georgia upset Auburn Saturday night 13-7 with a dominating performance on defense during the last three-quarters of the game. Georgia was triumphant in their upset win over no. 9 Auburn. The Bulldogs won 13-7 didn’t allow a first down in the game’s final 33 minutes. But Georgia didn’t dominate the entire ballgame. Auburn had an emphatic 15-play, 80-yard touchdown drive late in the first quarter. On that drive the Tigers were unstoppable, they ran almost every play. Georgia’s defense couldn’t stop sweeps, off-tackle, up-the-middle, or direct snaps. Auburn led 7-0 going into the second quarter. Then Georgia took over on offense and had a decent drive going. On third-and-13 Eason threw a deep pass to Riley Ridley for what could have been a touchdown… Had the defender not interfered with him. The Auburn corner tripped up Ridley and the freshman was unable to get under the ball. But there was no flag. Immediately the Sanford Stadium crowd erupted in a chorus of boos that lasted until Auburn’s next drive begun. But it also re-energized the Georgia team. On the defenses next outing, the ended Auburn’s possession with a 13-yard loss on a pass play from Sean White to Kerryon Johnson. Auburn had two first downs on that drive. After that, Bryce Ramsey pinned Auburn down at the 2-yard line. four plays later Auburn was punting, only one first down. In the second half Auburn did not earn a single first down. Georgia’s defense forced five three-and-outs in Auburn’s seven possessions. 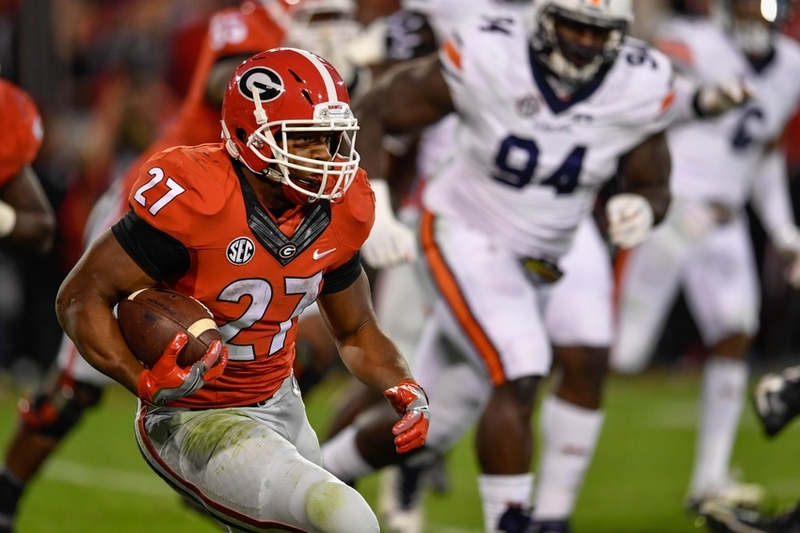 Maurice Smith intercepted a pass from White early in the third quarter and ran 34 yards to the end zone for Georgia’s only touchdown of the night. Although Georgia’s offense never scored a touchdown, they played very well. They had three 40-plus yard drives and set up a pair of successful field goals by Rodrigo Blankenship. In the final three-quarters, Georgia’s defense dominated and the offense played well enough. That can be traced back to the energy that the fans and players generated following the missed pass interference that robbed Ridley of a long touchdown catch.